Happy first Saturday of April, y’all!! How is the weather in your area? Getting warmer, I hope. It sure is around here and I am LOVING it!! The garden is doing well, and we *think* there are a few plants starting to sprout…exciting!!! I know it will be a few months before most of the plants to produce, but I am just so looking forward to having those fresh veggies right in my yard! I’m also looking forward to grilling and having friends over for some backyard barbecues. Warm weather = fun to be had!! These little sliders here are definitely a good warm-weather meal. The mango slaw all but screams summer! Aaaaand…since it’s grilling weather, you could even make the pork tenderloin on the grill instead of in the kitchen…add a nice smoky flavor to it!! But whichever way you decide to cook it, you’ll be glad you did – it’s a great little slider! Combine the vinegar, Worcestershire sauce, garlic, thyme,and garlic salt in a resealable plastic bag and mix well. Add the pork tenderloin, refrigerate and marinate for at least 20 minutes, up to 24 hours. Preheat oven to 350 degrees F, line a baking sheet with foil, spray with cooking spray and set aside. Remove pork tenderloin from bag to prepared baking sheet and discard the remaining marinade. Bake for 25-30 minutes, or until cooked through (little to no pink in the middle, or internal temperature reaches 155 degrees F.) Remove to a cutting board and allow to rest for 10-15 minutes before slicing into 1/2″ rounds. Meanwhile, combine the cabbage, mango and cilantro in a medium bowl. In another, small bowl, whisk together the olive oil, lime juice, sriracha and salt. Pour over cabbage mixture and toss to coat. 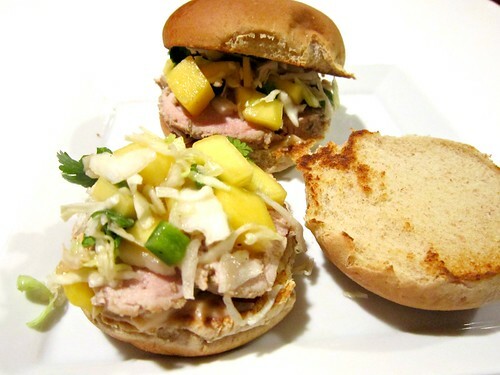 To assemble the sandwiches, place a couple of rounds of pork on the bottom slider buns, top with a spoonful of the mango slaw and the top buns.